As a fan of the Song of Ice and Fire series of books by George R. R. Martin, I have been watching the development and promotion of the new TV series: Game of Thrones, with a keen eye. 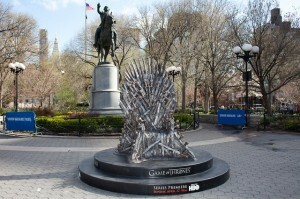 HBO’s promotional campaign is great example of a successful integrated marketing campaign. 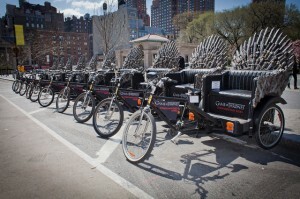 From seizing the throne, to free bicycle throne rides events and then integrating it with a Facebook, blog and Twitter campaign, HBO had a great promotional campaign. These promotions were highly successful judging by the 4.2 million viewers who tuned into the first episode. 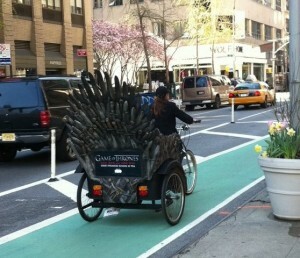 Although HBO had a large budget, they used it efficiently. By showing these events across all possible mediums, they used their dollars wisely. Make sure you do the same when planning and promoting your events. This entry was posted on Tuesday, April 26th, 2011 at 3:43 pm by Engine Communications and is filed under Advertising, Marketing, Public Relations, Social Media, Television. You can follow any comments to this entry through the RSS 2.0 feed. Both comments and pings are currently closed.